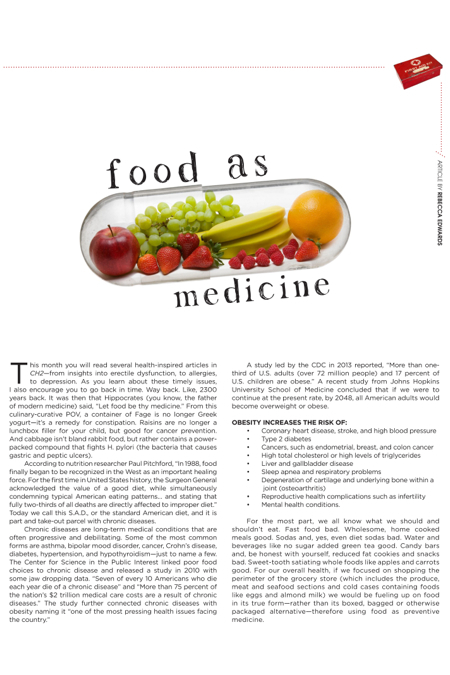 This month you will read several health-inspired articles in ??CH2? ?—from insights into erectile dysfunction, to allergies, to depression. As you learn about these timely issues, I also encourage you to go back in time. Way back. Like, 2300 years back. It was then that Hippocrates (you know, the father of modern medicine) said, “Let food be thy medicine.” From this culinary-curative POV, a container of Fage is no longer Greek yogurt—it’s a remedy for constipation. Raisins are no longer a lunchbox filler for your child, but good for cancer prevention. And cabbage isn’t bland rabbit food, but rather contains a power-packed compound that fights H. pylori (the bacteria that causes gastric and peptic ulcers). According to nutrition researcher Paul Pitchford, “In 1988, food finally began to be recognized in the West as an important healing force. For the first time in United States history, the Surgeon General acknowledged the value of a good diet, while simultaneously condemning typical American eating patterns… and stating that fully two-thirds of all deaths are directly affected to improper diet.” Today we call this S.A.D., or the standard American diet, and it is part and take-out parcel with chronic diseases. A study led by the CDC in 2013 reported, “More than one-third of U.S. adults (over 72 million people) and 17 percent of U.S. children are obese.” A recent study from Johns Hopkins University School of Medicine concluded that if we were to continue at the present rate, by 2048, all American adults would become overweight or obese. For the most part, we all know what we should and shouldn’t eat. Fast food bad. Wholesome, home cooked meals good. Sodas and, yes, even diet sodas bad. Water and beverages like no sugar added green tea good. Candy bars and, be honest with yourself, reduced fat cookies and snacks bad. Sweet-tooth satiating whole foods like apples and carrots good. For our overall health, if we focused on shopping the perimeter of the grocery store (which includes the produce, meat and seafood sections and cold cases containing foods like eggs and almond milk) we would be fueling up on food in its true form—rather than its boxed, bagged or otherwise packaged alternative—therefore using food as preventive medicine. Sure, we all need to middle-aisle-it at some point for olive oil or spices, peanut butter, or that canned or jarred good (I love jarred artichokes) that cuts our cooking time in half. And yes, sometimes I’ll be found in the snack section getting gluten-free pretzels for my kids. When venturing into these rows, I tell my clients to be an “F.B.I.” agent—or foodie behaving as an investigator. Read your labels. Unsavory ingredients like sugar, MSG, high fructose corn syrup and other preservatives like to sneak into many products. Also, when it comes to meal planning, I like to teach my clients the theory of “crowding out.” Crowding out is a concept created by the Institute for Integrative Nutrition that encourages you to fill your plate with nutrient-dense foods, therefore leaving no room for nutrient-deplete options. I would like to point out that not all people who suffer from a chronic disease are bad eaters. Sometimes the most health-conscious, kale-eating people get sick. Contributing to our overall health are issues like food allergies, lifestyle choices (high stress, low sleep, inactivity), our environment and genetics. These factors can play a critical role in how we feel and even lead to chronic inflammation (which many experts say leads to chronic disease) and or other physical symptoms. What I am saying, though, is that you must be proactive—especially if you are experiencing a health challenge. If you suffer from chronic disease and or chronic inflammation, you are not alone. The CDC reports nearly half of adults in the U.S. are living with at least one chronic illness. Narrowing the focus a little more, a recent Pew Research survey looking at just high blood pressure, lung conditions, heart conditions, diabetes and cancer found that 36 percent of adults in the U.S. say they are living with at least one of these five conditions, and 13 percent say they have two or more. Now let’s sink our teeth into some good news. Nutritious food has the power to help heal. (Note: This article is not attempting to override your physician’s recommendations and make any claim that food alone will cure you. It is simply “food for thought.”) Let’s look at three common conditions. Arthritis and joint disease affect 43 million people in the United States—that’s almost 20 percent of the population—and this number is expected to surpass 60 million by 2020. Because this condition is an inflammatory response, an anti-inflammatory diet like the Elimination Diet or Whole30 Program can be beneficial. Essentially, you want to look at omitting from your diet foods like dairy, soy, grains, gluten or sugar that might be triggering inflammation. Also, look to foods like salmon and chia seeds that are high in omega-3 fatty acids and vitamin D and fruits and vegetables teeming with vitamin C (bell peppers), carotenes (butternut squash), and bioflavonoids (strawberries). The CDC reported that only about half (47 percent) of the 67 million people suffering from high blood pressure have it under control, and this disease can lead to a heart attack, stroke or death. Channel your inner Popeye and pop some spinach into your mouth. This green, sweet-tasting, heart-healthy delight is low in calories but high in fiber, potassium, folate and magnesium. Bored of salad? Try a full serving of spinach in a smoothie or disguised in homemade muffins or lean chicken burger patties. Depressive disorders occur in approximately 18.8 million American adults, or about 9.5 percent of the U.S. population age 18 and older. Again, you can’t go wrong with folate-rich foods like asparagus—try smoked salmon wrapped steamed asparagus—and antioxidant-rich foods like cranberries. (I make a mock wine with sparkling water and pure cranberry concentrate juice.) Also, opt for foods like avocado that are high in glutathione (a tripeptide made up of three amino acids–glycine, L-cysteine and L-glutamate that aids in repairing tissue and your immune system).